The big event last weekend was the Grand Designs exhibition in London. Omlet took a selection of eglus down for the three days of the show but James and Will weren’t quite prepared for the level of interest as thousands of people descended onto the stand opening eggports, pulling out dropping trays and trying to decide whether to have a pink or green eglu! Reinforcements were called for the weekend and by Sunday evening most of Hertfordshire, Kent and Essex had seen an eglu and were just going back to measure up that space next to the greenhouse to check that it would fit! Thanks to everyone who came, it’s always great to meet people who care about their animals, we will keep you updated of the other shows we are going to throughout the year. A: It drives a yolkswagen! When you think about it, there is a wide range of treats that you can give your lucky hens in the afternoons. Grapes and sweetcorn seem to be universally popular with my girls while lettuce is also gobbled down enthusiastically. Bread soaked in milk or water is considered very appetising with a little drizzle of honey on top (blimey Barbara what lucky chickens! – Ed) while sunflower hearts and pumpkin seeds are also very popular, especially if they are sprinkled on the grass which makes them harder to find and all the more tasty for the effort! For the non-squeamish, maggots bought from a fishing tackle supplier are a real treat. They are also good for making sure that they don’t get crop problems thanks to all that wriggling! My chickens will keep the garden weeds down for me by tucking into dandelions as well as the slugs they find on their expeditions through the flower beds. There are certain things that should never be fed to chickens though – meat, citrus peel, banana skins, uncooked potato peelings, chocolate, fish bones and salted foods. Things like bread, pasta and potato should really be fed in moderation because tubby chickens don’t lay as well! the artist Jane grew up in! 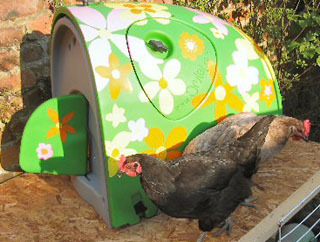 It’s a groovy look for the eglu – has it inspired you to customise yours? The forum has been busy celebrating the first anniversaries of eglus and chickens arriving in gardens all over the country! Leanne and Andy were the first forum members to receive their eglu so they put pen to paper and wrote a poem to commemorate the great event. Now we can’t believe its been a whole year! We cannot claim our nerves were steady! And smiled as they happily scratched all about! Hands-on experience you don’t find in books! Eat one of our eggs and you’ll come back for more! Who’ll live happy lives until their natural old age! My grandfather tells me there was a time when even the panes in the windows were made of horn! Nowadays glass is the norm for windows but horn is still the traditional material for an egg spoon. I always think that producing your own eggs entitles you to being a bit of a connoisseur of these marvelous little oblong food packages. You will be able to appreciate the delicate way in which the horn doesn’t cool the egg or tarnish the flavour like a metal spoon would. It really is the supreme way in which to enjoy a perfect boiled egg!